The Alliance Lincolnshire Service Hub offers a range of specialist early years services across the Lincolnshire area. An established local early years service, we actively support Alliance members to deliver a choice of high quality, affordable local childcare including pre-schools, day nurseries, toddler groups, nursery schools and children’s centres. We also offer specialist packages to meet the needs of early years professionals from bespoke training for local partners such as Lincolnshire Council to advice to early years professionals and students with an interest in the early years. Some services we currently deliver include practical support and advice to local providers about how to successfully recruit volunteers, encourage parents to become engaged in their child's learning and development, support with set-up of new parent and toddler groups. Specialist local training packages also include First Aid, Family Learning and Ofsted inspection preparation support. We also create and deliver bespoke workshops to individual settings who may require assistance about more complicated issues. 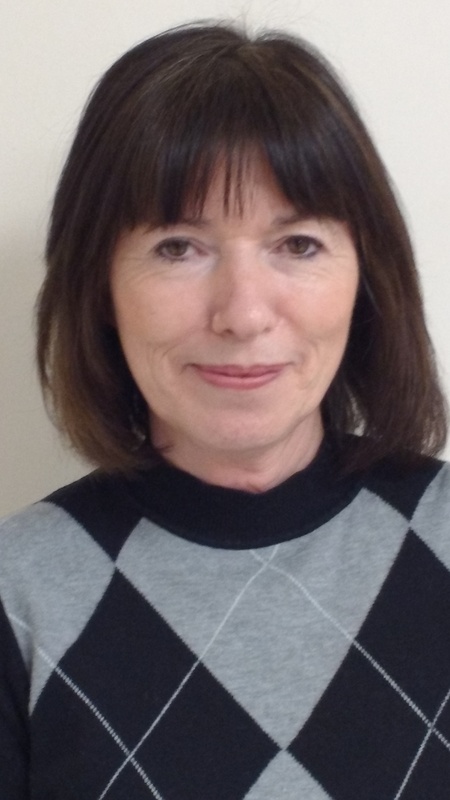 Please contact Susan Hagan, Service Hub Manager on susan.hagan@eyalliance.org.uk or 01507 527500. Be ahead of the game and join us for an interactive webinar, via a computer link, with Alliance Quality Improvement Director, Michael Freeston, and Policy and Standards Manager, Melanie Pilcher, focusing on what the new Ofsted Framework will mean for you. Ofsted's new inspection regime will be introduced in September 2019. The Education Inspection Framework has an increased focus on the intent, implementation and impact of the early years curriculum provided for children. This webinar will consider the implications of the proposed changes for the sector, and will give practical advice on how providers in group and home-based care can prepare for a successful outcome at their next inspection. Refreshments will be available on arrival, and there will be an opportunity to network after the webinar, to discuss how the changes will impact you, your team, children and families. "Great fun. I enjoyed every moment of the evening. Very relaxing but informative. Good interactive activities without feeling pressure to join in." "Loved it. Want to come again. Brilliant info and enthusiasm." 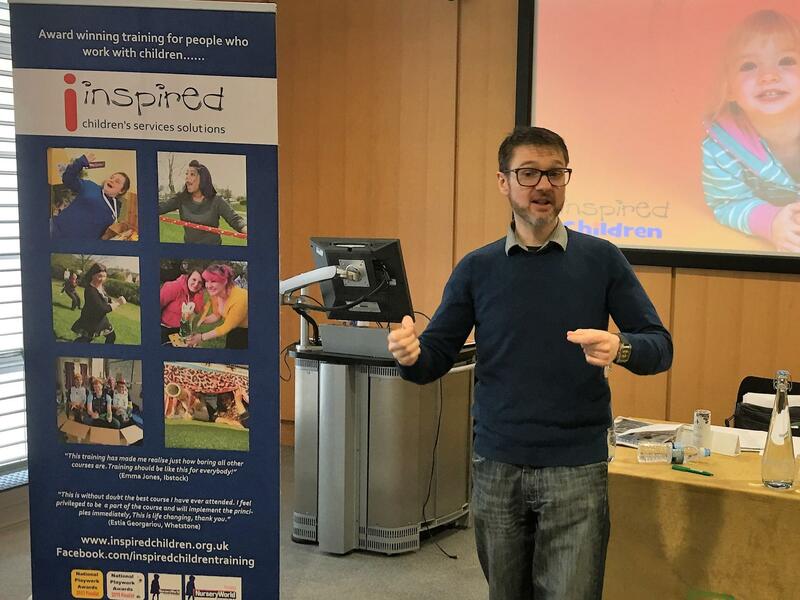 "Excellent information and presentation from Ben, and useful to make you think about our practice and how this looks to Ofsted - just be ourselves!" If you have an idea for an event or meeting topic you would like to see Lincolnshire hold or have any other suggestions, please contact Susan Hagan – Service Manager on susan.hagan@eyalliance.org.uk or 01507 527500. 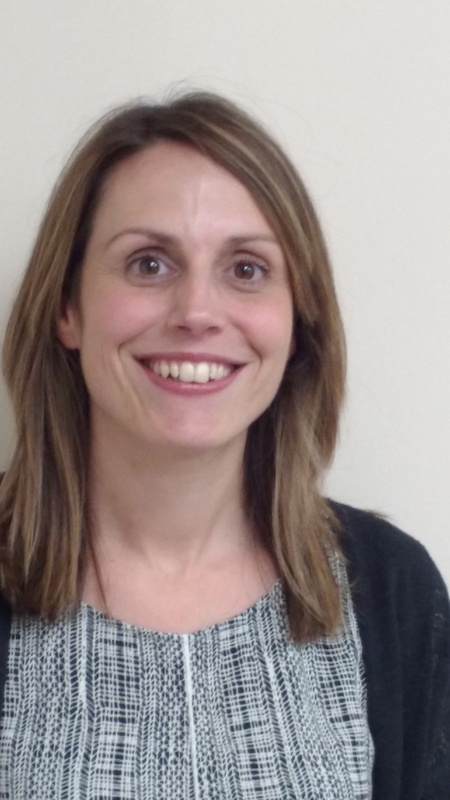 At the recent Family and Childcare Trust Parent Champion Conference, our Skills Development Team Leader, Katie Blay, gave a presentation on the successes of the Parent Champion Scheme in Lincolnshire. The Alliance delivers the Best Start contract within Lincolnshire County Council's children's centres and in some outreach locations. This service has two elements: the Early Years Service; and the Skills Development Service. We offer local families a range of ​high quality, affordable and flexible childcare for children under five. Reflecting the needs of the local area, Lincolnshire Alliance-run childcare services are long-established, offering child-led, learning through play and fun activities for very young children. We actively encourage parents to become involved in their child's learning and development. We remain committed to ensuring every child receives focused support to best meet their individual needs. Parents are welcome to visit our settings and meet the team, simply contact the setting directly to arrange a suitable time. To go to the mini-site for any of the settings below, please click on the setting name. Lincolnshire Council offers funded early years entitlement places to eligible two yearold children for up to 15 hours per week during term time or as a 'stretched offer' for 12 hours per week over 48 weeks per year (with settings who chose to deliver this model). Lincolnshire County Council Early Years and Child Support confirms funded places on an individual basis with the parent and/or professional who makes the application. Children become eligible for the funded entitlement for two year olds from the term after their second birthday. Eligibility continues until the end of the school term in which the child turns three, and the child can then access the universal funded early years entitlement for three and four year olds. For a list of childcare providers who are approved to deliver two year old funded places, please contact the Family Information Service. All these providers are also approved to offer universal three and four year old funding, but not all three and four year old providers are approved to offer funded places to two year olds. The Early Years Service has a team of highly trained and motivated early years educators who deliver high quality early years sessions across all Lincolnshire children's centres, for children aged 0-5 (siblings aged up to 8), including 'Big Cook, Little Cook', 'Learning Together', and 'Growing Talk'. 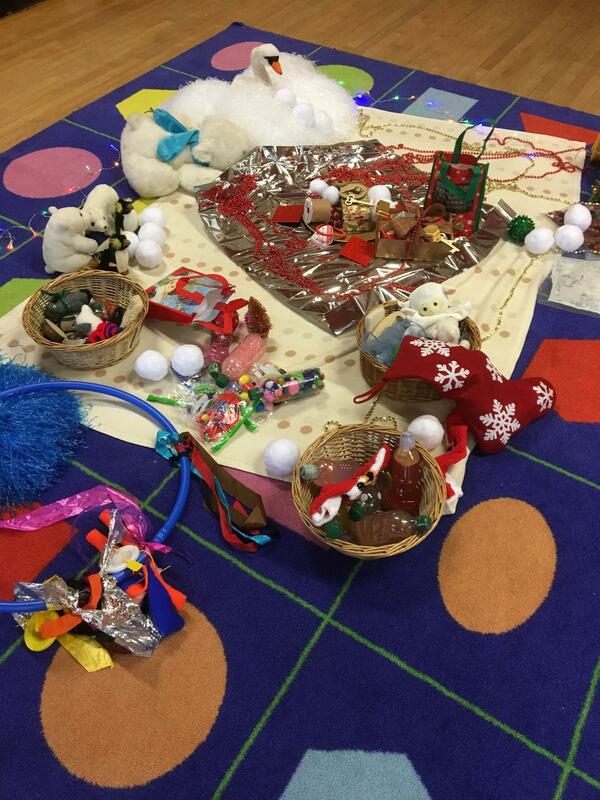 Our early years team also deliver ante natal sessions alongside our Health partners. These sessions are all underpinned by the EYFS principles and are designed to support children's early development and school readiness. The Skills Development Service have a team of experienced skills development officers who support families with children aged 0-19. The skills development officers work with parents to help them to understand their skills and identify any gaps, supporting them into volunteering, adult learning and/or employment. 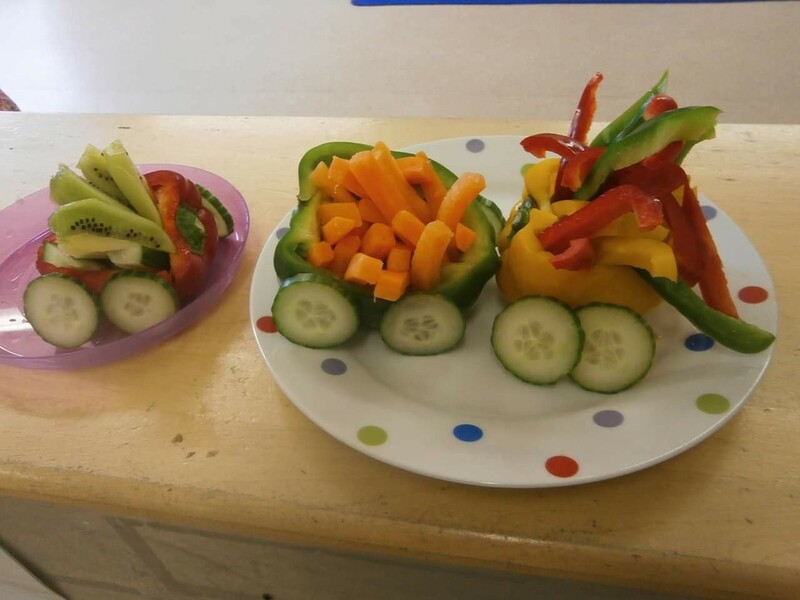 This amazing Veg Train featured at a Learning Together Baby session in Gainsborough recently. 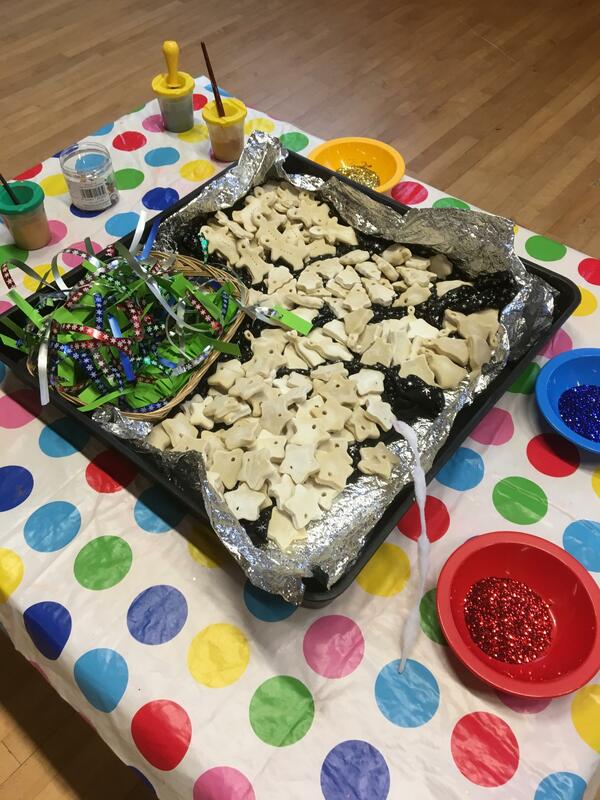 Senior Early Years Educator, Clare Brightman, commented that the "Little ones loved exploring and tasting". 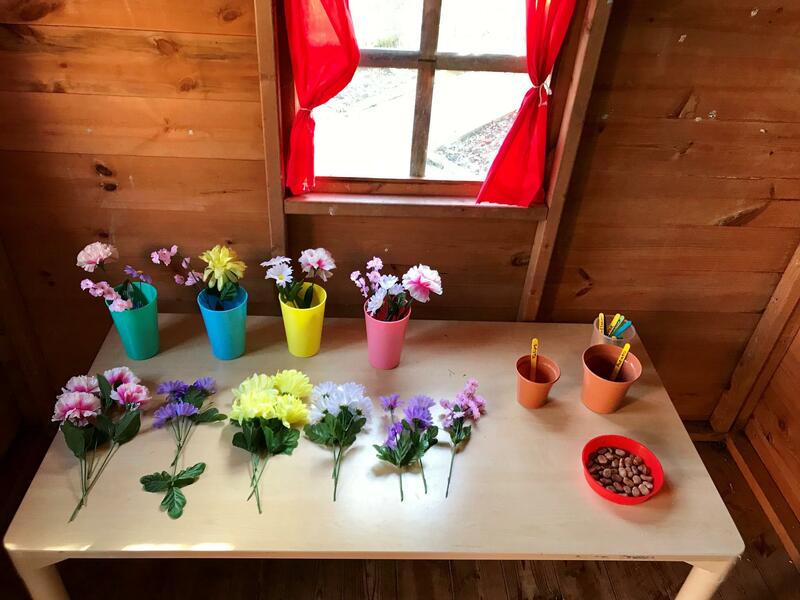 Early Years Educator, Katie Munro, has recently implemented some changes to the outdoor role play area at Bracebridge Children's Centre, and reports that "The children have been very generous in delivering flowers, and have enjoyed using the tools in the garden." 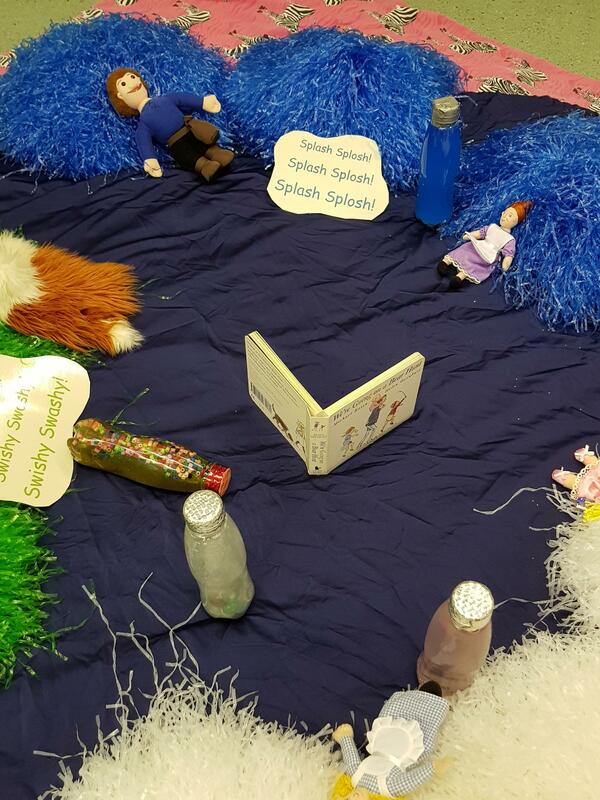 The Sugar Game, created at Mablethorpe Children’s Centre, by Julie Stirling (Senior Early Years Educator), was distributed to all Children’s Centres in East Lindsey for Early Years Alliance staff to use in sessions, during Obesity Awareness Week. Alongside the game itself, other visual aids were provided, such as local and National Childhood Obesity facts and figures, hidden names for sugar, and sample food labels. 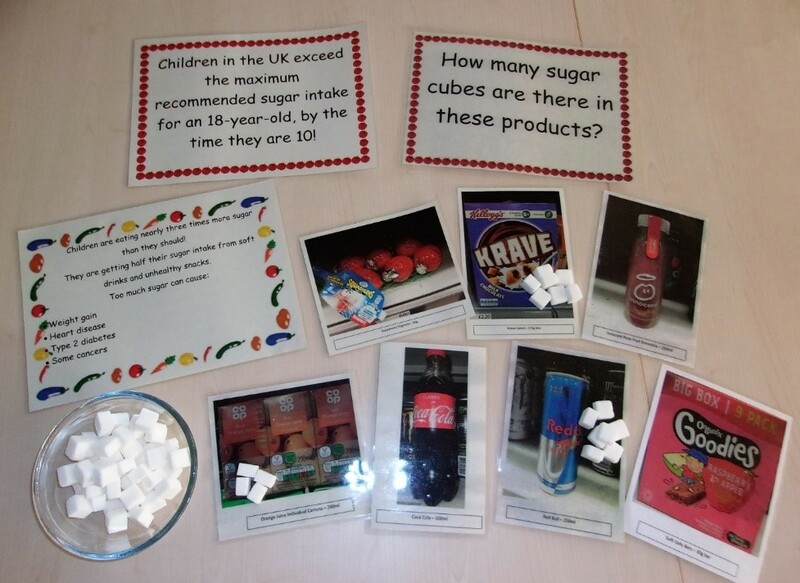 The game was a simple one, pictures of popular food and drinks were placed on display, and a question was asked, “How many sugar cubes are in each product?” The parents were provided with a bowl of sugar cubes and they had to place as many cubes on each picture as they thought the product contained. The game initiated many conversations amongst the parents about the food and drink we eat and give to our children. Parents were most shocked by the sugar content in fruit smoothies and breakfast cereals. This in turn, gave way to conversations about food labelling and ‘hidden sugar’ and the many different names used for sugar on packaging. The game worked well in raising awareness of the amount of sugar in foods in a fun way, and certainly brought the subject to the fore, for discussion. During the week’s activities, families were encouraged to visit the Change 4 Life website to find ways to ensure their children are having a healthy diet and lifestyle. On the website families can also download the Change 4 Life Scanner App, which scans barcodes for sugar and fat content. Many of the activities took place on 18th January, which had been renamed as Fruity Friday. All families attending groups on Fruity Friday were given fruit as a snack or to take home to eat. 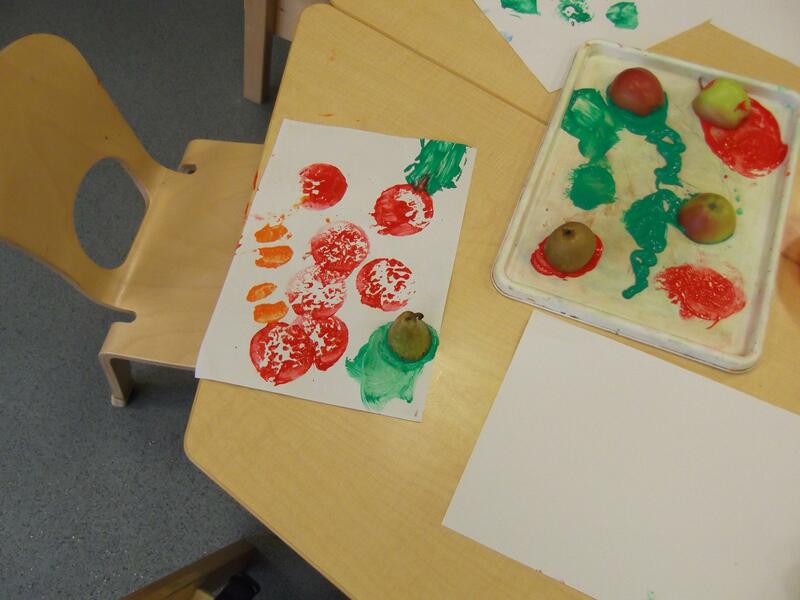 Some groups used fruit during play, to explore the textures and smells…as well as the taste. All groups were linked to children’s physical development, focusing particularly on gross motor skills and being active. In order to recognise National Obesity Awareness Week, we held 'Fruity Friday' on Friday 18th January in Children's Centres across the county. Other healthy lifestyle activities were promoted during the week, with us all celebrating on 'Fruity Friday'. During the autumn of 2018, we upgraded our hexagonal planter at the Children's Centre, to help improve the resources available for the children outdoors. The planter was intended for growing vegetables, but wasn't deep enough to grow anything properly, so we decided to have a re-vamp. 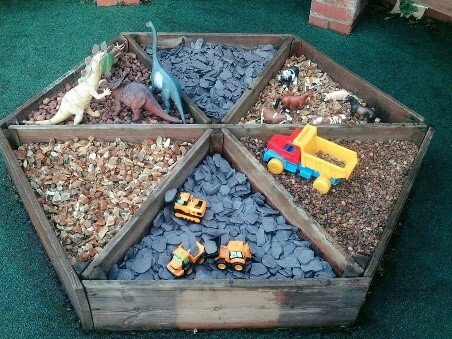 Local builder's merchants were emailed asking if they could spare any bags of gravel, slate or pebbles for us to convert the planter into a senory play area. We had a reply from one company who offered several bags of aggregates for us to use, free of charge. They kindly offered to deliver the material directly to the garden, so all we needed to do was empty the planter and refill it with the new materials. The children have enjoyed exploring the new textures and selecting their own resources from the shed to use with the different ypes of pebbles and slate. It has proved very popular, particularly with some of our older children, as they enjoy using the construction vehicles to make their own building site. It is perfect for scooping and pouring as well as being versatile enough to be used during any themed session in the centre. 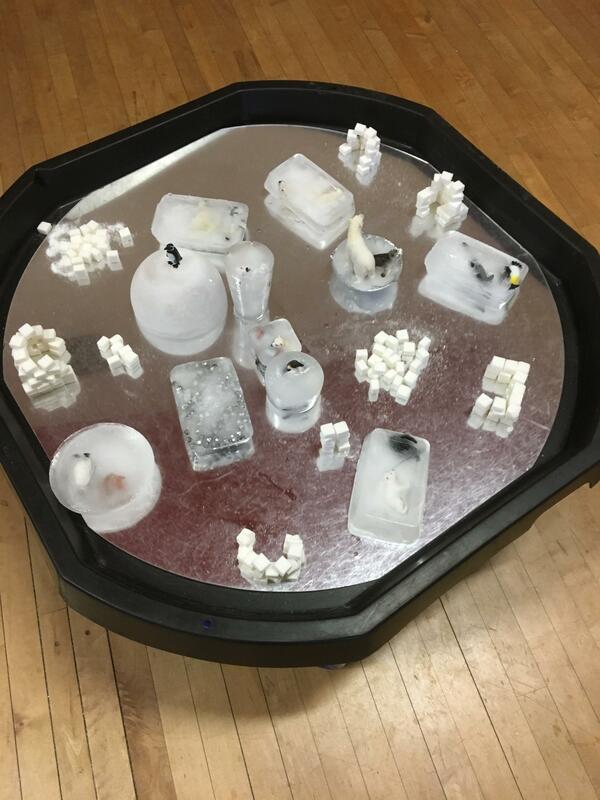 The ice scene was touched, igloos built, and wow moments as animals appeared as the ice melted. The baby area was well explored, with texture, colour and sensory options. The sensory bottle making stand was a great hit, with children taking them home to show older siblings. The salt dough decorations were individually painted and taken home for the Christmas tree or for presents for Grandparents. The card making craft table was modelled well by parents, and the children enjoyed sticking and cutting. 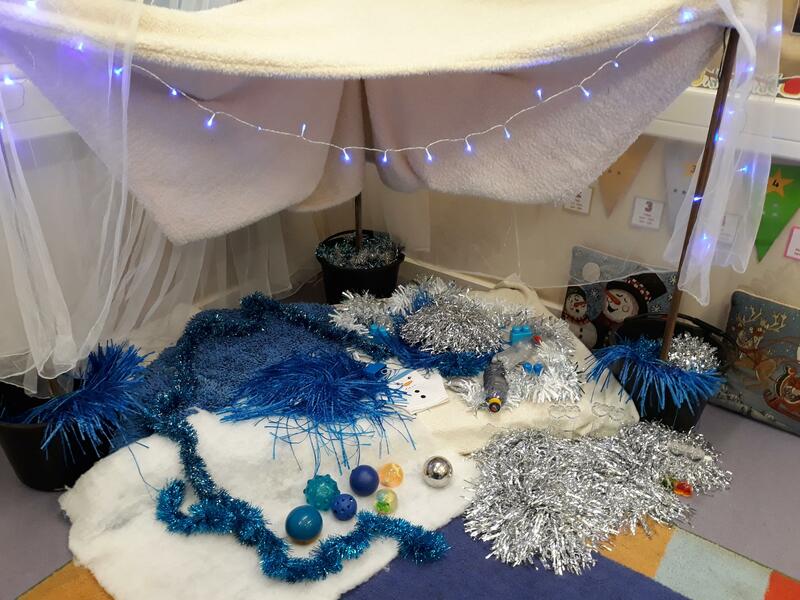 The treasure hunt not only excited the little hands delving in, but also became a blue and white snow shower experience for many, resulting in numerous smiles. 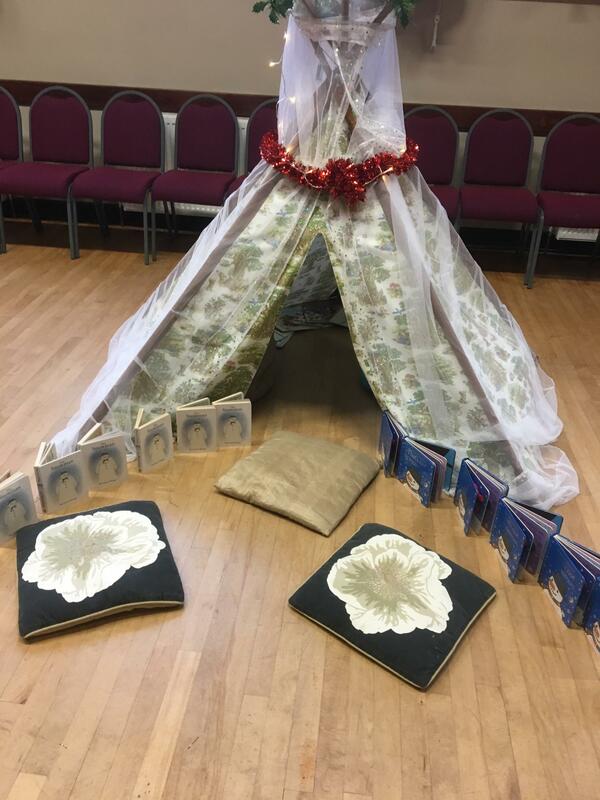 The white tipi hosted a den area for reading the sharing books 'Snowman' and 'That's Not My Snowman'. Adults read, Early Years Practitioners read, and children read to themselves. The coconut conditioner, cornflour, sticks, and googly eyes table made for lots of nice smelling snowmen. The large room was filled with seasonal smiles. 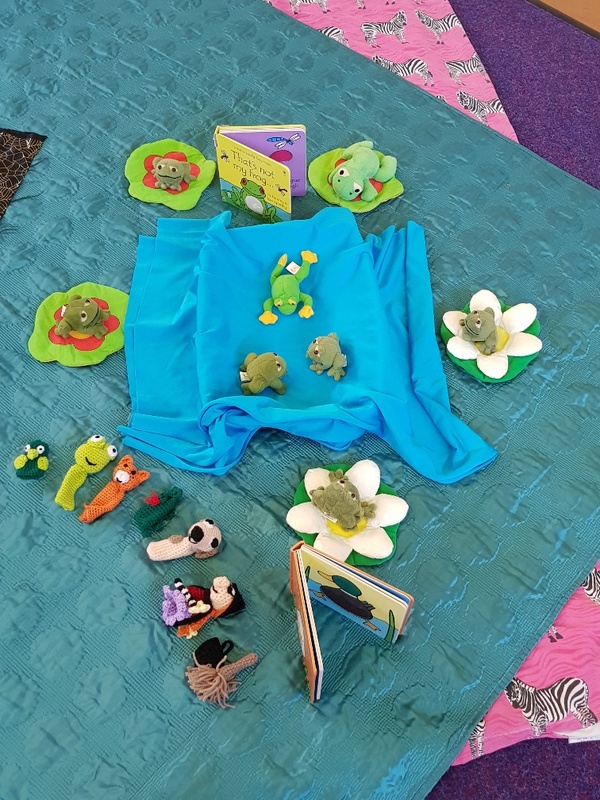 A number of book themed sessions have taken place at Market Rasen Children's Centre recently, including 'Gruffalo Child Learn Through Play Book Session' and 'Going on a Bear Hunt Little Explorers Session'. 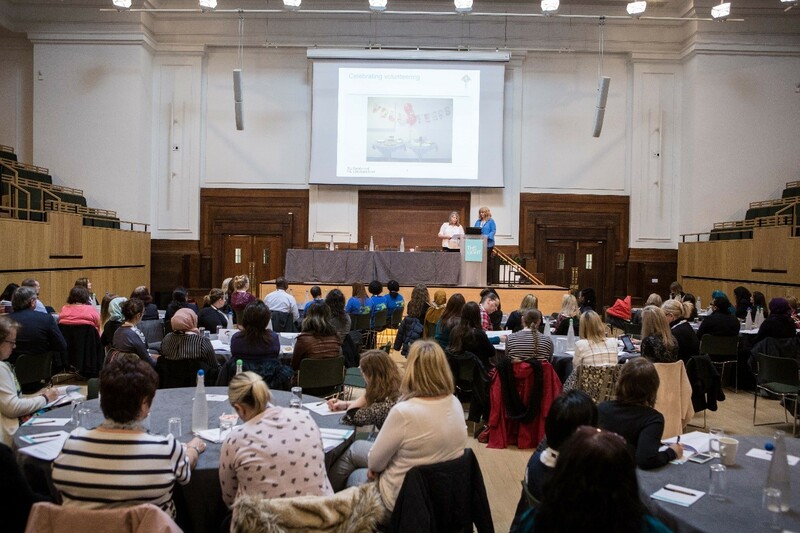 These, together with other initiatives such as signposting to the health visitor, and the setting up of a safe area in the community room, have had a positive impact on the numbers attending sessions. In the words of Early Years Educator, Nicola Jones: "We have had a definite increase in age range and mums comfortable using other sessions with the aim to get their sitters on the move, and to come to experience different Best Start sessions at Market Rasen, growing their confidence and stretching comfort zones." Children were able to enjoy a Winter Wonderland event at Lincoln Central Children's Centre recently. 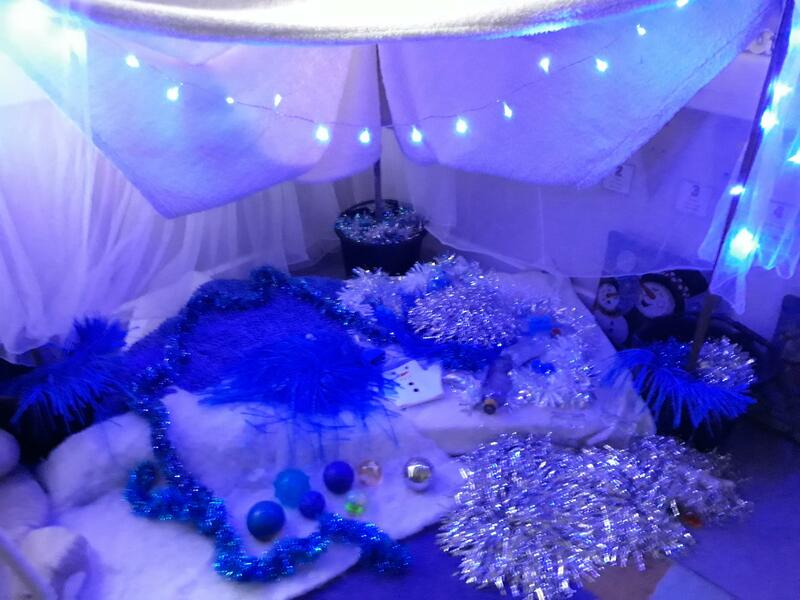 Senior Early Years Educator, Sharon Hurt, created a den for the event with lots of lovely resources for the children to engage with. 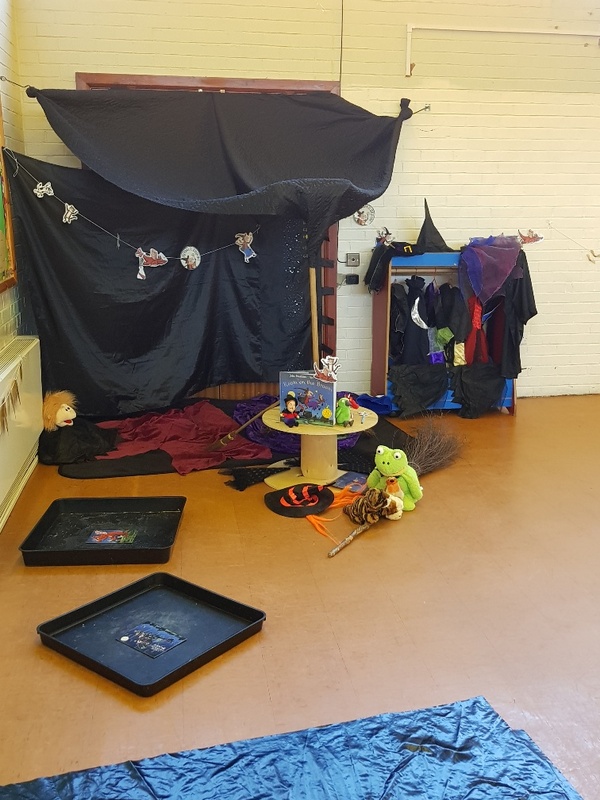 This event was themed around the book 'Room on the Broom' in the half term at Lincoln Abbey, Witham and Lincoln St Giles Children's Centres. 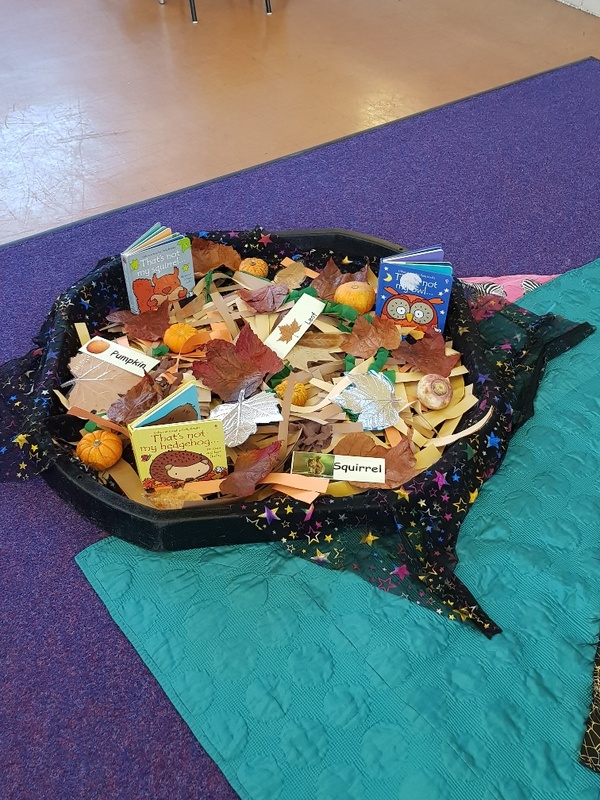 There were a variety of activities from the book, to encourage families to engage with, including: Mud and the Dragon, Making Wands and Broom Sticks, Autumn Tuff Spot, Potion Making Station, Making Bird's Nests to Take Home to Eat, and Role Play Area. The feedback from families was that they loved the sessions. I created the story stones at home after seeing something similar on the internet, and I'm so glad I did! They turned out really well, and the children love them. I made them with my daughter's paints and a black whiteboard pen. I used non-toxic glue to varnish them, to ensure the pictures would not come off. They are so simple and effective. When using the story stones, I placed them in a story/sensory domed basked. 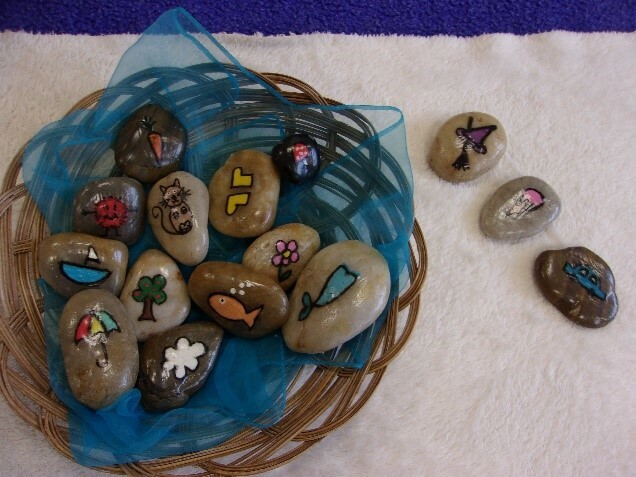 When I lifted the lid, I chose a child to pick a stone so we could begin our story. I then asked another child to pick another stone, and so on. This is the fun bit for the children as they are required to use their imagination to create the story. Therefore, the story is always different, and sometimes silly, which makes it so much fun. You can ask questions throughout to encourage the children, such as "What happened next?" and "What did they see?" 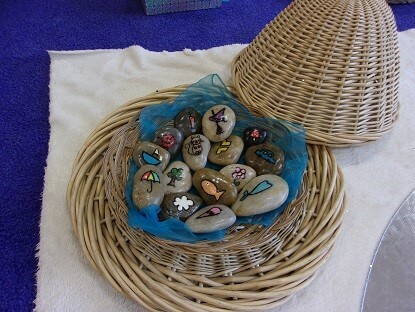 The stones are great for helping to promote language, listening and attention, imagination, and making storytime fun. They can be used for a range of ages. I used them in Learning Together Toddlers with four children aged two years plus. One one occasion, after using the story stones for a moment, I asked "What happened next? ", to which one young girl joined in and said "The witch had an ice cream... it was yummy". When we finished the story, the children clapped and another girl said "The end!" The parents in the group were impressed by how well their children reacted to the stones, and engaged in storytime. Two of them said they are going to have a go and make some story stones at home to use with their child. 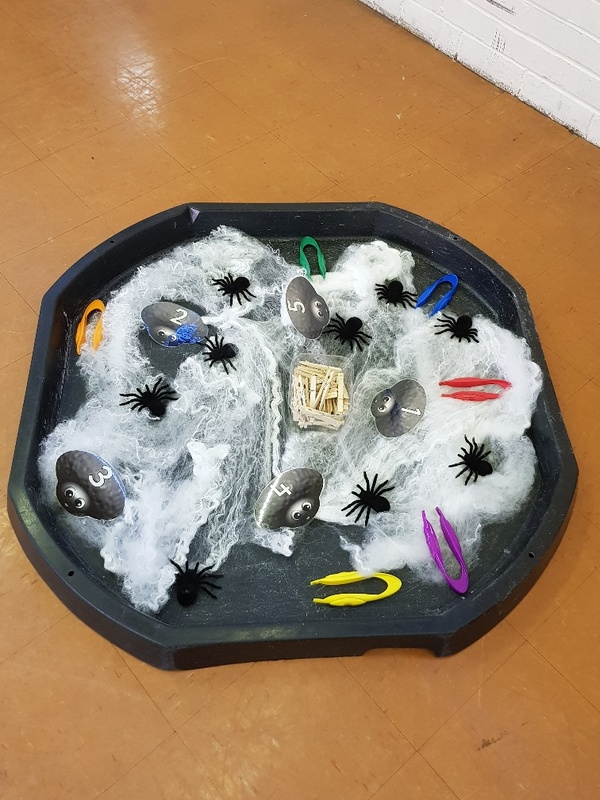 The stones have also been used by a senior early years educator in a Growing Talk session, and proved to be a valuable and exciting resource to support a session. I have also had to make some at home for my little girl, and she loves them. We take it in turns to read a story, using the stones, and have to do this most nights. 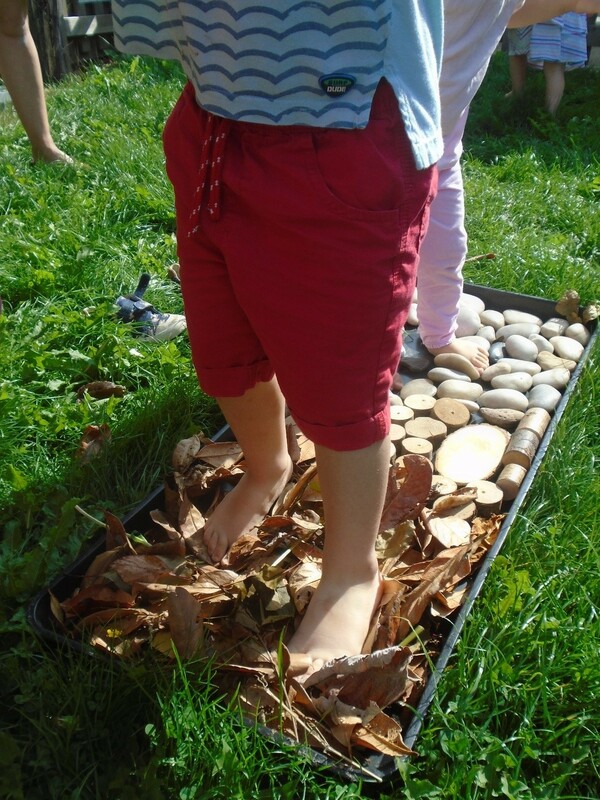 To satisfy one particular child's love of sensory experiences and give an alternative way to explore through her sense of touch, the early years educator, Lisa, prepared a Barefoot Walk of pebbles, logs, leaves, mud and water, in the long grass of the garden area at Skegness Children's Centre. Lisa took off her sandals and initially led the children over the natural resources. 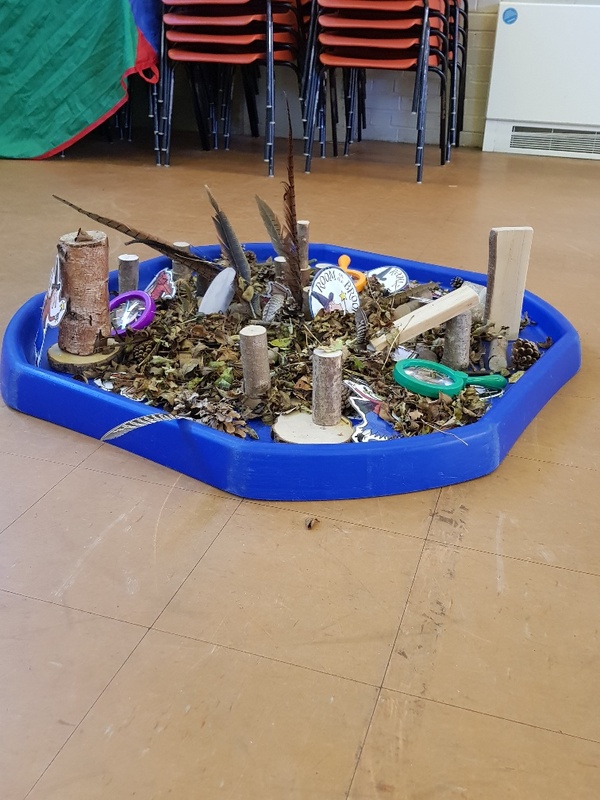 This encouraged all the children in the group to safely negotiate the different levels and textures, so promoting physical development and become in tune with the natural environment. The experience enabled positive interactions between parents and children, as parents took off their shoes and had a go too! On Friday 13th April, a gardening event was held at the children's centre. The children started a vegetable patch, planting lettuce and chantenay carrots from plug plants, and seed potatoes. They also began work on a flower garden, planting some lavender and also some sunflowers from seed. The children were encouraged to water the flower garden during group sessions. 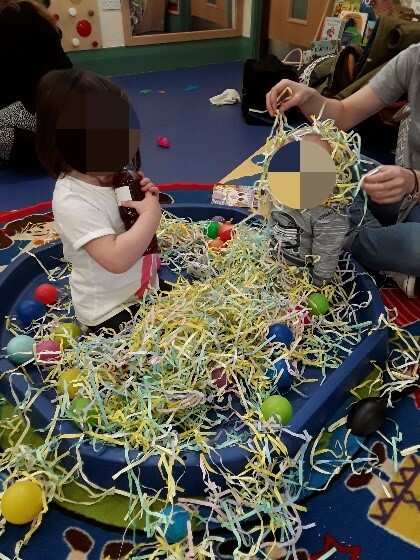 The children had a lot of fun pulling the carrots and potatoes, and the early years educators were able to incorporate lots of language regarding size and shape. Parents said they couldn't believe how easy it was to grow vegetables, and were going to try it at home. Lots of produce was grown, and was then used in 'Little Explorers' sessions. The children enjoyed giving the vegetables a wash and using the special (pampered chef) safety knives to chop up the potatoes and carrots. A lot of the carrots were eaten raw during the process as they looked so delicious! 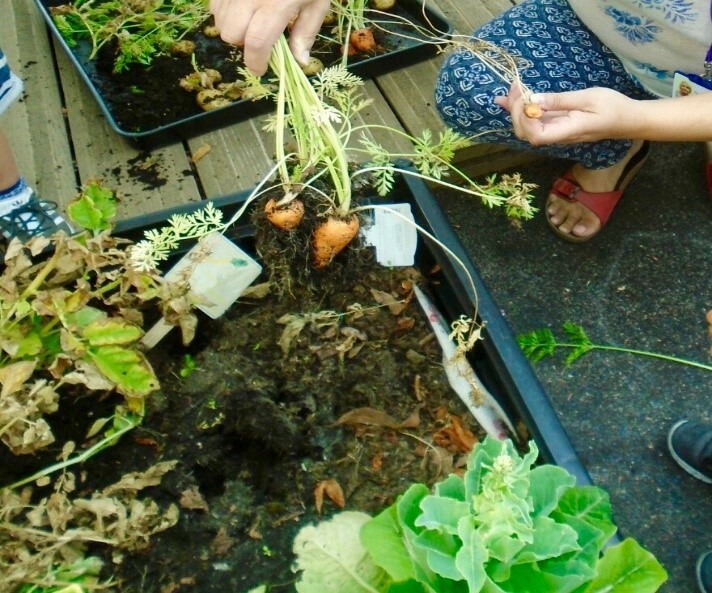 Some of the vegetables were saved for the 'Learning Through Play' session in the hall, to promote the outdoor area and encourage parents to attend different groups. 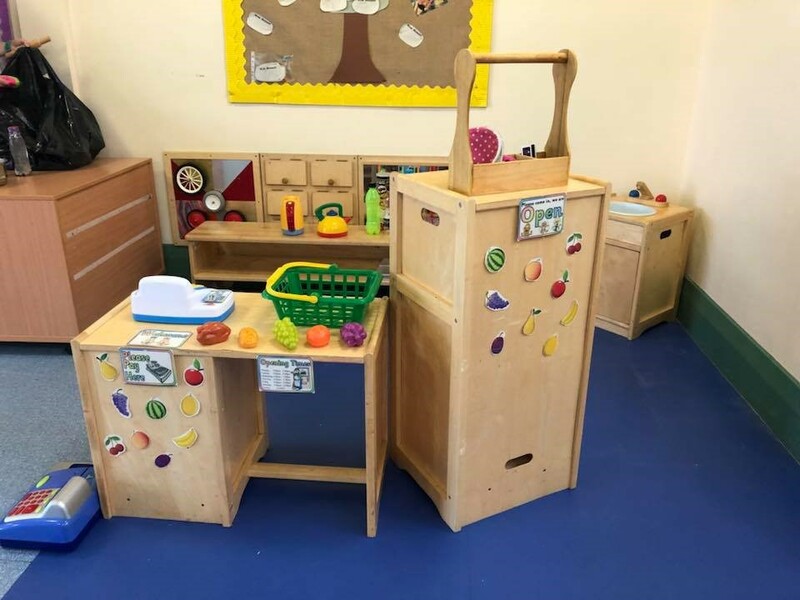 The Early Years Educators at Birchwood Children's Centre recently changed their home corner into a shop which has led to the children developing in all prime areas of the EYFS, and has proved to be a great way for parents and carers to engage with their children. Communication and Language: The toddlers have been using a wide range of vocabulary and people skills within the shop, and it has supported turn-taking and listening and attention skills. "...it has been great to see the children take turns and understanding their roles as workers/customers. The strength of conversation skills have really come on since we made the shop, and new relationships have been formed. It has also been great to see parents engaging in their children's learning as they have been using role play with their children." Maths: A till was added to the shop to encourage early maths recognition. The Early Years Educators created and laminated coins and notes with numbers on to prompt the children's number recognition. 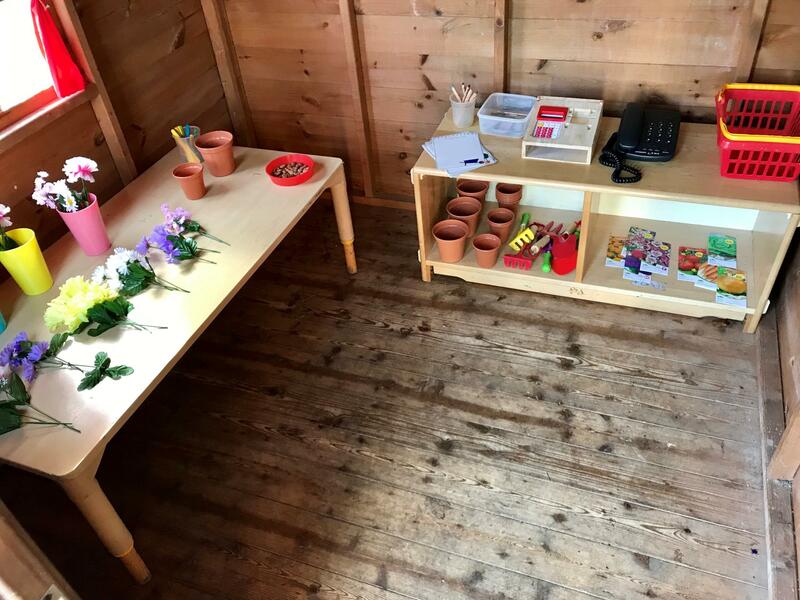 "It was clear to see the children's understanding of how a shop worked, and it encouraged children to work alongside one another, taking it in turns. Language of 'more' and 'a lot' showed the children were understanding quantities." Physical Development: In keeping with the shop theme, the Early Years Educators provided tinned fruit for the children's sensory exploration, and tweezers to pick the fruit up with, strengthening their fine motor skills. "We also used the shop by having playdoh cakes. 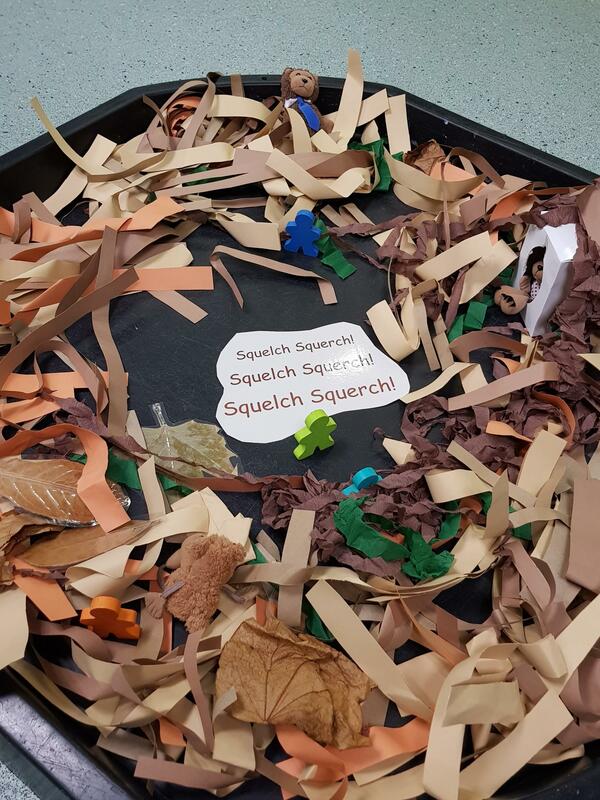 The children really enjoyed being creative with this activity; developing their fine motor skills by squeezing, pinching and rolling the dough." 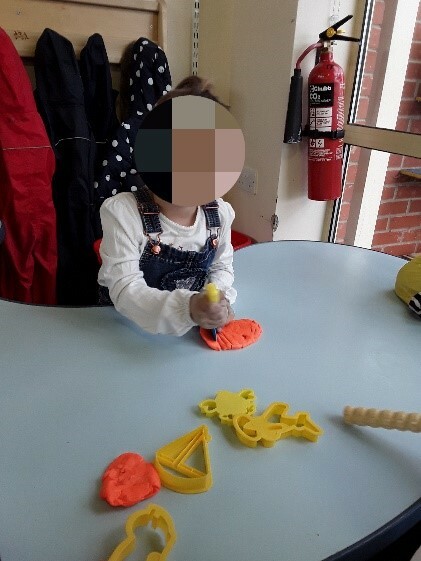 Personal, Social and Emotional Development: With the shop being a popular change to the centre, the children were encouraged to take turns fairly with the support of a sand timer. By the end of the first week, the children understood and were patient waiting for their turn. The shop has also promoted friendships amongst the children, and increased their self-confidence. "Children have played alongside one another, acting out roles as customers and shop workers. It has been great to see the progress of children's self-confidence within their acted out roles. It has been clear to see the children enjoying the responsibilities in carrying out small tasks around the area, with children even adding other toys/objects to enhance the area. For example, dinosaurs from a different area are now on sale in the shop!" 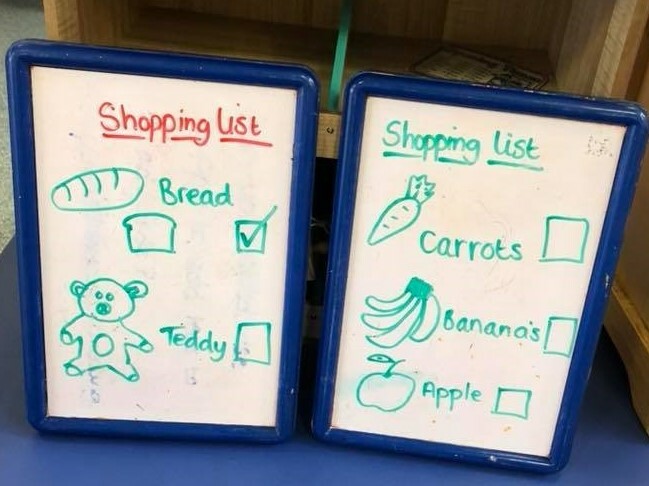 Home Learning: To extend learning further, the Early Years Educators asked the children to use a picture shopping list when they go shopping with their families. "Feedback from parents said it was a great distraction whilst out shopping and got the children engaged and excited in a task that normally feels like a chore!" 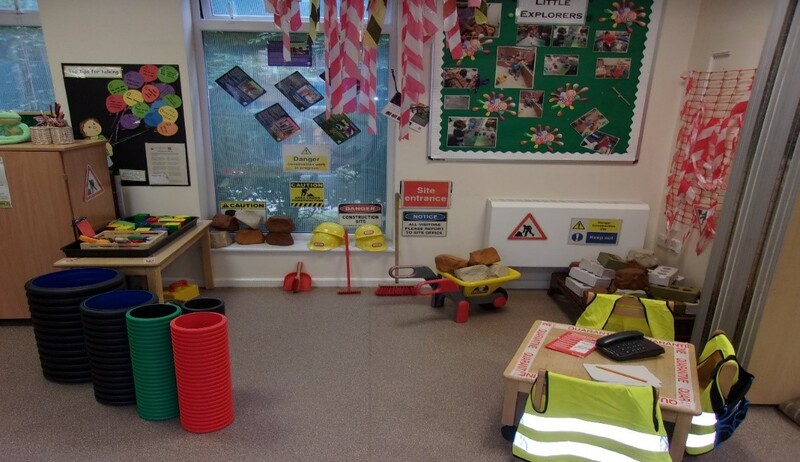 Claire, Early Years Educator at Horncastle Children's Centre, recently changed the role play area from a kitchen to a construction site. 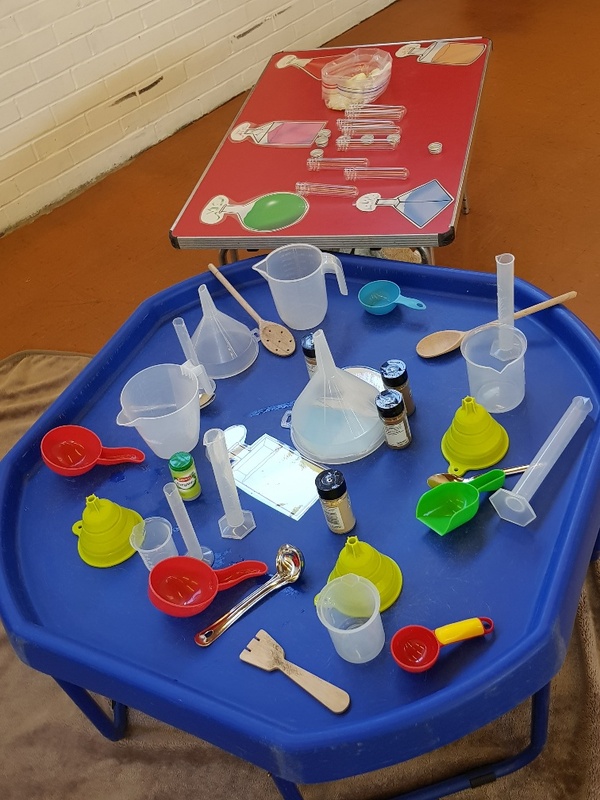 The reason for this was the children were not interacting with each other or playing appropriately with the resources, which had a negative effect on the behaviour of some of them during the sessions. Claire had observed children with a keen interest in stacking and rolling different types of equipment, but was mindful of ensuring the area was inviting for all when enhancing it. 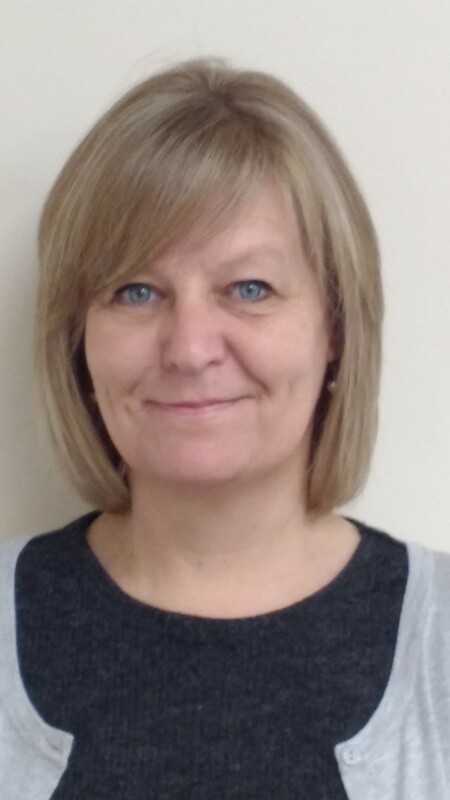 Claire visited local merchants to source equipment which was extremely successful as they were willing to donate valuable resources such as pipes, tape, orange temporary fencing and leaflets. The area is proving to be very popular, especially with the more tactile children. 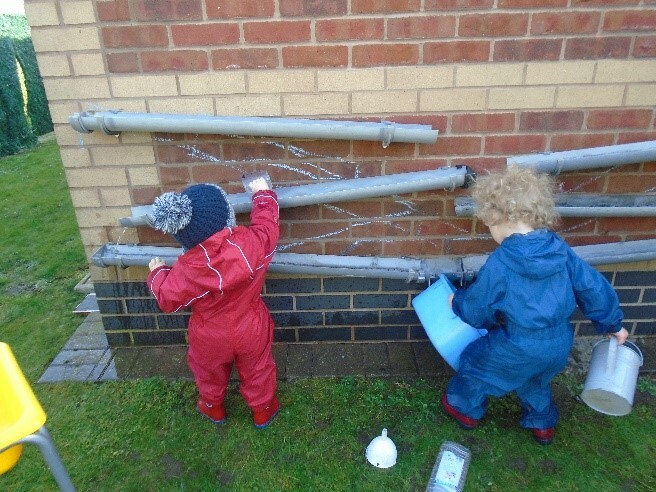 They have had fun using the pipes to balance on and post items through. 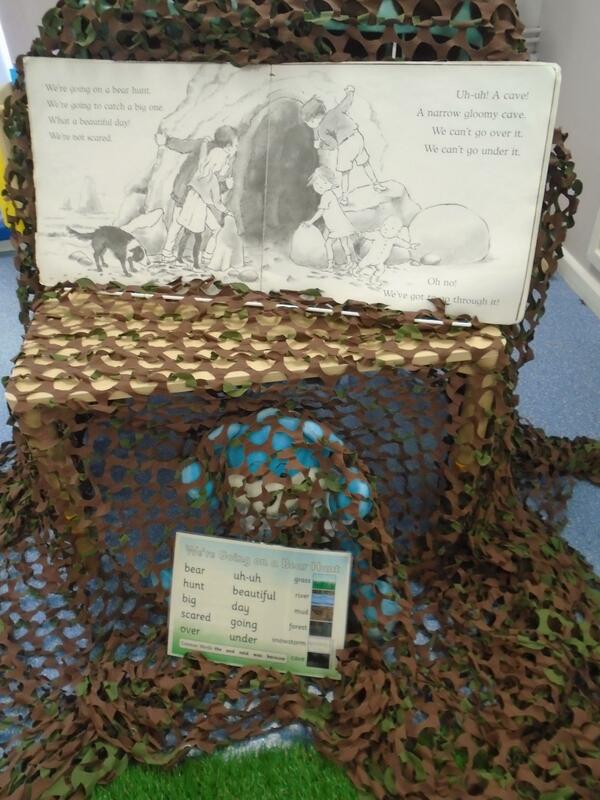 The construction site also provides opportunities to support children's learning and development in all areas, but in particular Literacy as the environment is rich in print, so the children can learn about words using names, signs, posters etc. Parents have commented on how inviting the area now looks, and how much enjoyment their children are getting from the new construction site. 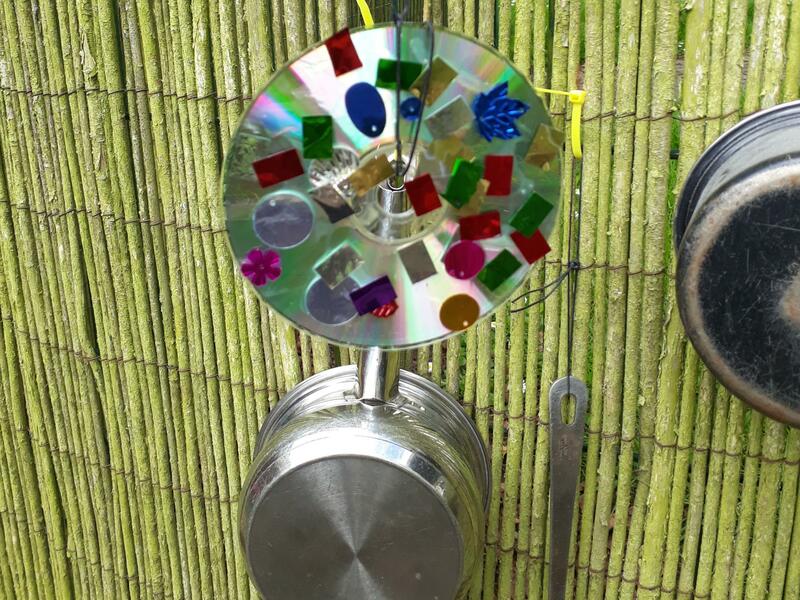 The Early Years Educators have made a music wall at Bracebridge Children's Centre, and the children contributed by making sun catchers out of CDs and sequins. Gardening Week is a national scheme that took place from 30th April to 6th May 2018. At Cherry Willingham Children's Centre, we planned lots of fun things to celebrate this. We painted stones, made lard bird feeders, planted seeds, dug in the mud and looked at insects. 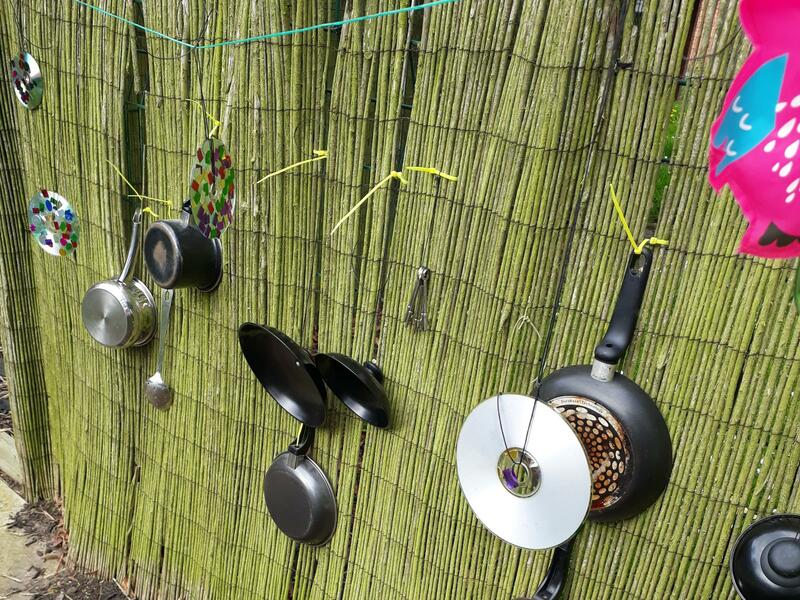 We also created a mini beast area in our garden. Children developed their physical skills and hand/eye co-ordination through using the tools for digging and by using the brushes to paint the stones. Children also developed their communication and language skills as parents talked to them about the process of making the bird feeders and planting the seeds, as well as talking about the different coloured paints. Understanding of the world was also covered as families talked about seeds and how plants grow. 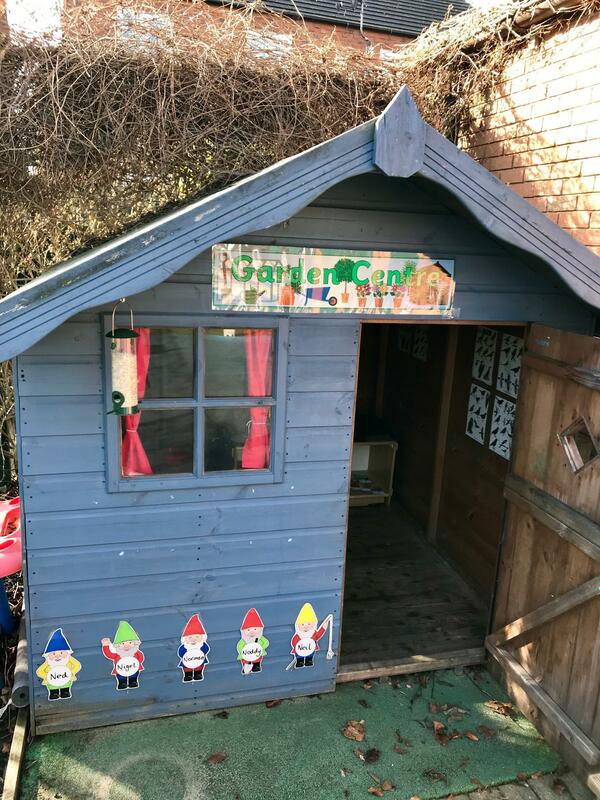 Children's imaginations were developed as we changed the home corner into a garden centre, enabling them to do lots of pretend play. 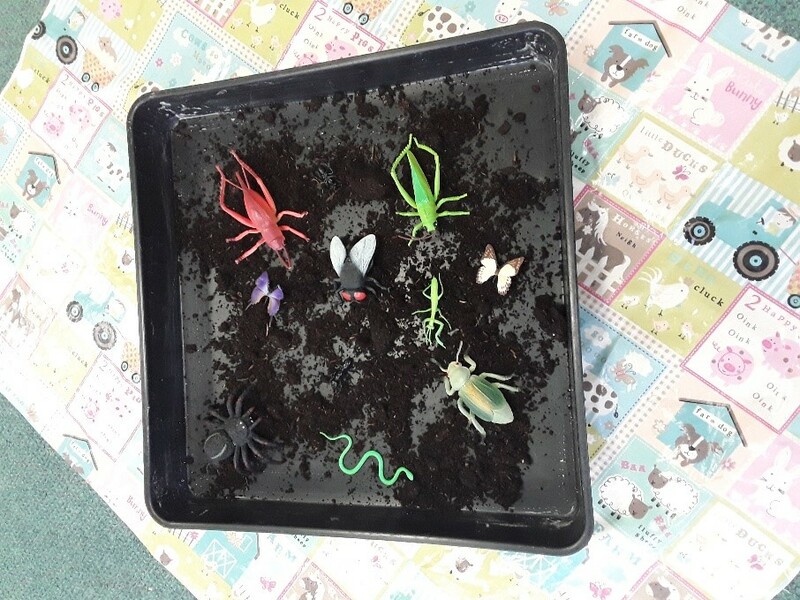 Children were provided with problem solving activities too, as the plastic insects were placed in ice and they had to work out how they could get them out. One of the grandparents commented that there were lots of lovely activities on offer and said he enjoyed the fact that there were lots of things to take home. One of the girls sat for a long time painting the stones - she painted four in total! Two boys sat and throught about how they could get the insects out. They worked out if they picked one up and dropped it, the ice broke. They were very excited to tell the practitioner of their success. 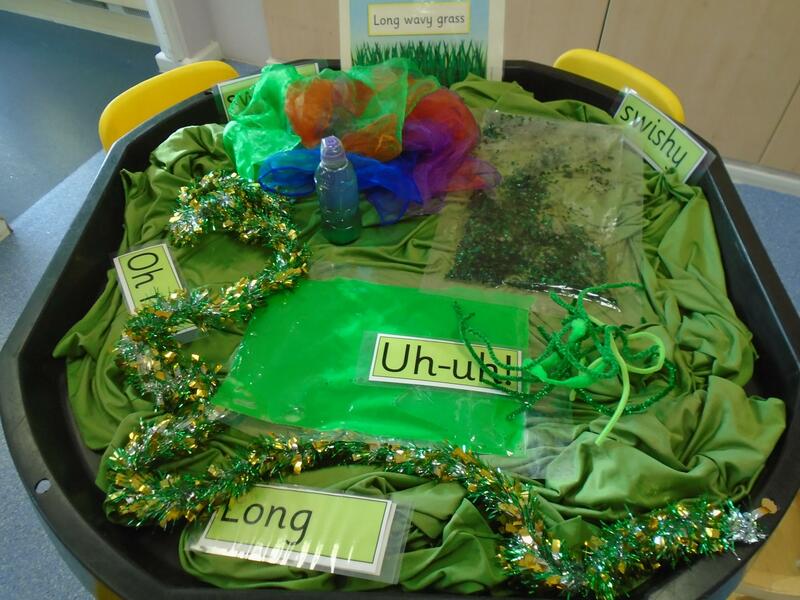 The following week, a parent told the practitioner that the cress they had set had grown really well. We will continue to further develop the garden, adding to the mini beast area. The following week's session, we also continued with the gardening theme by making Cheerio bird feeders to take home. 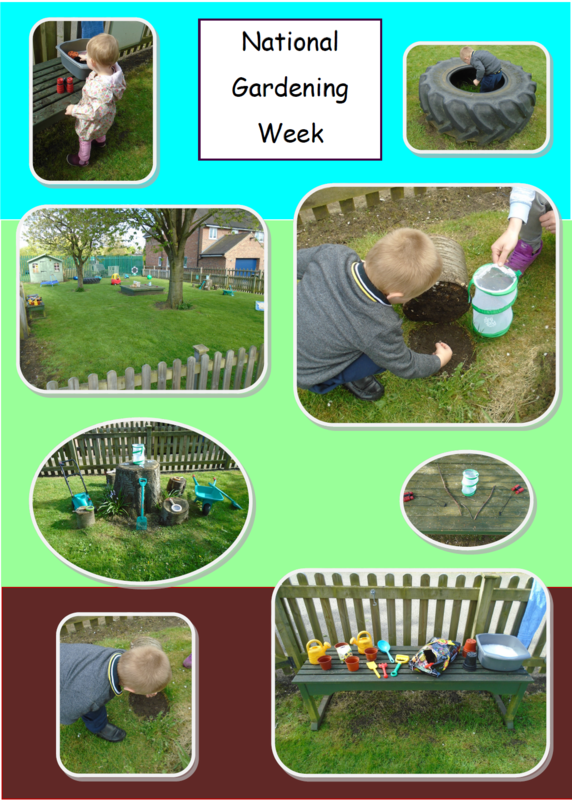 National Gardening week was celebrated at Little Explorers and Learning Together Toddler groups held at Spilsby Children's Centre recently. 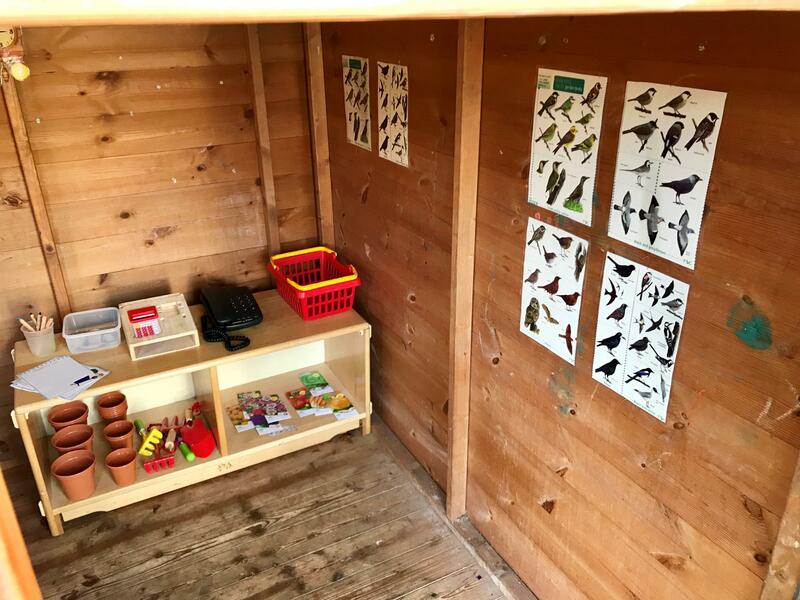 Activities , such as planting, building bug hotels and making bird feeders, were provided for inside and outside, supporting children in all prime areas of learning, with a particular focus on physical development, and communication and language. 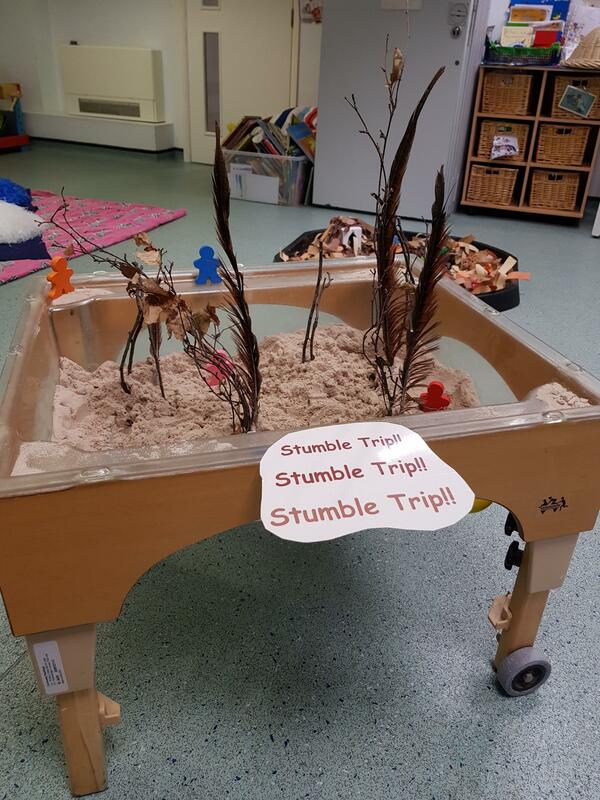 Children, aged from nine months to three and a half years, explored the soil with their hands, picking it up with their fingers and sprinkling it back into the tray. Some chose to use trowels, scoops and spades to fill and empty different containers. Children were supported by their parents/carers to make bird feeders. They mixed melted lard and added it to the bird seed, using different sized spoons and other utensils. Some used teaspoons to scrape the mixture off, when adding it to empty yoghurt pots. One child struggled a little with this, so used her problem solving skills to find a different way to achieve the task - she used her finger instead! Children were very engaged during the activities. They shared items such as twigs and pine cones to put in the 'hotel', labelling them "acorns". The children placed the items on the shelves, as we chatted about the different bugs that might come and stay: ladybirds, beetles and ants. One child became very excited when we saw a beetle. He shouted to his mum, "We can see a beetle!" 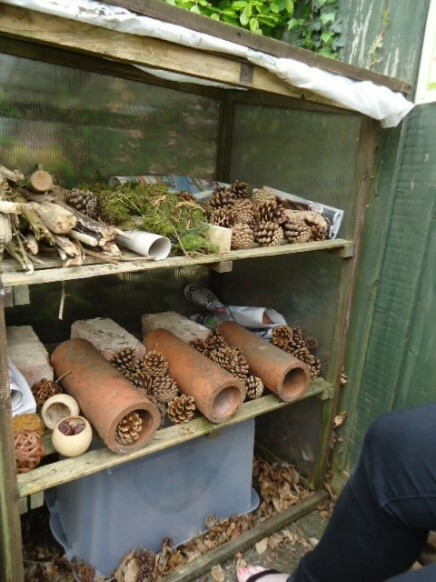 A parent commented that her son loved building the bug hotel with Steph in Learning Together Toddlers. He even went home and told his daddy how he had given sticks, acorns and pine cones to Steph for the "ladybird" house. A wonderful time was had by all. Water play is not only incredibly fun for small children, but it also enhances their physical, cognitive and social skills. When children pour water, they are improving their physical dexterity and hand-eye coordination. They extend their vocabulary as they learn new words and talk about what they are experiencing. Here at North Children's Centre, water play is a big part of our children's learning and development, and it is a provision that we provide in the majority of our sessions. In fact, we found that on the occasions that we did not provide water play, the children would access water from other means, such as taking a bucket from the sand pit and filling it at the indoor sink, or using puddle water to fill, transfer and empty small containers. We wanted to provide a resource that would give our children a continuous provision to explore water in the outdoor environment. So, we asked around, and found someone who was willing to donate all their old guttering, and transformed it into a water station for the children... and then the fun really began! 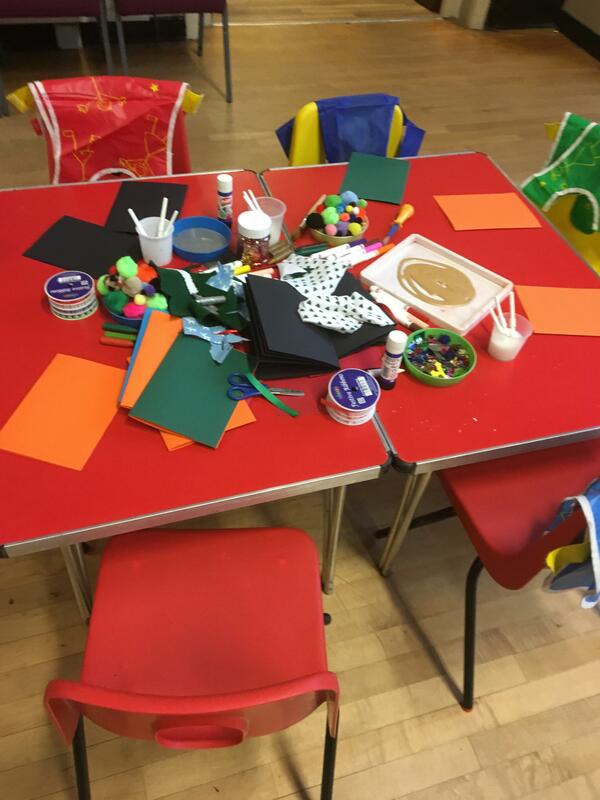 An Easter Event was held at Birchwood Children's Centre, with a focus on fine motor skills, linking in with targets to get all children to be confident and use their hands in a variety of ways, building their muscles up ready for early writing. Cereal was provided for the young children to explore, helping them to build their hand-eye coordination by sitting in it and feeling the texture. They also watched the cereal being dropped from a height, which helps them to focus and builds their eye muscles, helping them with concentration, and in the future with following a line as they write. The children played with shredded paper, grasping it, throwing it away from them, and watching it fall. Children need to develop the large muscles in their arms before they can hold a pencil and write, and activities such as this can help. Playdoh was provided for the children to poke, squeeze and mould into a variety of shapes. This helps to build up the small muscles in their hands, preparing them for school age when they will have to hold writing equipment to create marks on paper. At the end of the session, the children took home a rabbit book each, to 'read', turning the pages from left to right and looking at the pictures. The children were also given playdoh recipes so they could have a go at home to make their own. The different sessions of the day were all aimed at one focus, and hopefully will give parents ideas of the kind of activities they can provide for their children which are simple, inexpensive, and have lots of benefits.